A Medicare Advantage plan isn't for everyone, so don't forget to take a look at our article that covers Medicare Supplement Plans. There are so many issues to consider that are a part of picking the ideal Medicare plan for your circumstances. It is typically more than a little stressful! The good news is, we are here to help you make an informed decision. Regardless of your circumstances, it all begins with choosing between two primary options. The first option is selecting Original Medicare combined with Part D and Wisconsin Medicare Supplement Plan. Our second option is to select one of the many Wisconsin Medicare Advantage Plans (MAPD). What's the major difference between Medicare Advantage and Original Medicare? Original Medicare which includes Part A and Part B insures essentials like hospital expenses (Part A) and any doctor visits (Part B). It is referred to as Original Medicare mainly because it was the initial form of Medicare program developed by our government in 1965. Individuals can incorporate an optional Part D plan to their Original Medicare to have your prescription drugs covered as well, and you can even add a Medigap plan (Medicare Supplement Plan) to deal with the gaps in the Original Medicare plan. If you select Original Medicare, it is advisable that you add Part D (to get prescription drug coverage) and Medigap (to help cover the expenses of Original Medicare). Without having these two supplements, it will likely be challenging to pay for prescription drugs and other medical related expenses. Alternatively, you can choose the second option, the Wisconsin Medicare Advantage plan. Medicare Advantage is a privately managed alternate option to Original Medicare (which is controlled by the government). A Medicare Advantage plan pays for all of the costs of Original Medicare, and typically contains Part D drug coverage as well. A Medicare Advantage plans may even provide extra solutions that Original Medicare will not pay for like dental, hearing or vision coverage. So the question is: Which option will work best for your individual circumstances? When the Medicare system was first put in place, beneficiaries had just one method to obtain their health-care insurance coverage: Original Medicare (Part A and Part B), the federally administered insurance program. Later, the Medicare program broadened to include Wisconsin Medicare Advantage Plans as an additional way for beneficiaries (insureds) to get their Medicare Part A and Part B insurance coverage. Medicare Advantage plans are health insurance policies offered by Medicare-approved private insurance organizations. If you join a Medicare Advantage plan in Wisconsin, you have your coverage implemented through the Medicare Advantage plan, in contrast to the government-run Medicare program. Although your specific benefits can differ when it comes to Medicare Part C, dependent upon your particular plan and your location, each of the Medicare Advantage plans has to offer at least the same level of insurance coverage as Original Medicare, Part A, and Part B. So when you compare Medicare Advantage plan choices in Wisconsin, you can do so while knowing all of the plans must come with the same standard level of coverage. One feature of Medicare Advantage plans is that they might cover extra benefits beyond Original Medicare. Even though Original Medicare doesn't cover regular vision or dental, hearing, or wellness programs, you may very well be able to come across Medicare Advantage plans that cover these added benefits. With a HMO you are going to get most of your medical care through your primary care physician and be obligated to get referrals from your primary for specialist care. In comparison, a Medicare Advantage PPO plan provides you the alternative to use out-of-network service providers if you like; despite the fact that your cost-sharing is generally less if you use in-network providers. You won't need a primary care doctor and can visit specialists directly without requiring a referral. A Medicare Advantage HMO plan will require you to use in-network physicians and hospitals for health-care services; you're generally not covered if you choose non-network service providers, with the exception of emergency or immediate care. There are some details that you need to be aware of when looking at a Medicare Advantage Plans in Wisconsin. Part B items, like chemotherapy drugs, are normally only covered at 80% just like traditional Medicare. Prior approval required for some services - Having some procedures paid for can be challenging. Medicare Advantage plans are not ideal for everybody. Considering that managed care plans intend to keep health care expenses within budget, they attempt to avoid overuse through various methods — such as requiring "prior authorization" for things like surgery, home health care, hospital stays, and some medical equipment. Your health professional will have to provide additional evidence before your Medicare Advantage plan will pay for these expensive services. Copays due before services - With Medicare Advantage plans you are required to take care of your copays before you are treated. Therefore, if you are in need of multiple physician visits, you may be required to take care of significant copays upfront before you visit your physician or obtain any health care. Diminished freedom to choose providers - Using Original Medicare, you can decide to visit any physician who will take Original Medicare. This will mean that you can have access to major medical centers across the country. On the contrary, Medicare Advantage plans are more restrained when it comes to the provider networks they work with. A network is a catalog of doctors, hospitals, or pharmacies that negotiate pricing with insurance companies. Dependent upon where you are living, it could be frustrating to locate a local physician or hospital that works with Medicare Advantage. If you decide to see a physician or visit a hospital that isn’t in the insurer's network, you will typically have to pay higher medical costs. 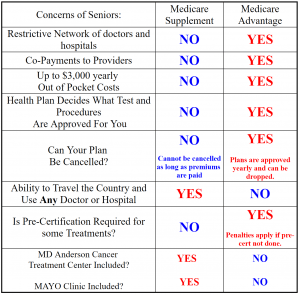 See the Medicare Advantage-Medicare Supplement comparison below. Nevertheless, this leaves out an essential point. In most states, if you've been enrolled in a Medicare Advantage plan for more than a year, you will not likely to be able to sign up for a Medigap policy, which helps most people cover the gaps in Original Medicare. At a minimum, you may be subject to added “underwriting” – an analysis of your risk as a recipient. Therefore, be mindful that if you stay in your Medicare Advantage plan for more than a year and subsequently try to go back to Original Medicare, your Medigap options will be limited or even nonexistent. The point to remember here is to have the facts before you make a decision that could possibly lead to disappointment. You can get the information about the advantages and disadvantages of Medicare Advantage plans by contacting the Medicare Solutions Team at (920) 545-4884 during normal business hours in Wisconsin, or contact us through our website whenever it’s convenient for you. In an attempt to reduce any confusion around Medicare Advantage plans in Wisconsin, it's essential to have an understanding of how Medicare Advantage plans have been changed this year and how your medical expenses -- and treatment options -- will change. A thorough understanding of how your chosen plan works will help you minimize your healthcare expenses for the year. Before you consider remaining with the same plan you had last year, you should review it thoroughly to see if anything significant has changed. The most typical adjustments to Medicare Advantage plans include the list of drugs that the plan will cover and how much it will charge for them, the premium amount (how much you pay for the plan each month), and responsibility in cost-sharing (copayments and coinsurance). Medicare Advantage Plans might also change the network coverage from year to year, so always check to make certain your primary care doctor is still part of the network. In most rural areas, it's especially important to verify that the network you prefer includes a wide variety of specialists in your area. Should you choose to switch over to a different Medicare Advantage plan for 2018, undoubtedly check the medical provider network prior to making any changes. If provider networks in your current area are especially thin for 2018, consider converting to a non-network type of Medicare Advantage plan such as a Private Fee-for-Service (PFFS) plan or a PPO. With PPOs (Preferred Provider Organization), you can easily use out-of-network providers although you will likely pay extra to do so. PFFS plans may or may not come with a network; the plans that do have networks typically also charge you extra to use out-of-network providers. Although the loss of insurance companies in the ACA (Obamacare) is relatively well-known, the inadequate insurance coverage of Medicare Advantage in certain areas is not. As of 2017, 147 different counties have virtually no Medicare Advantage insurers whatsoever. The affected counties are principally in rural areas and are scattered across 14 different states. Whether this situation will improve or worsen in 2018 still remains to be seen, but it's undoubtedly a concern -- especially if you live in one of the rural counties. If you find out that there are no Medicare Advantage plans near your location that meet your needs, think about changing to a Medigap plan (Medicare Supplement Insurance). Medigap is coupled with original Medicare (Medicare Part A and Part B) and will cover many healthcare costs that won't be included in those parts of Medicare, so these Medigap plans can function as a great alternative for Medicare Advantage. The State Health Insurance Assistance Programs offer free Medicare guidance and assistance in every U.S. state. This advice can be especially useful anytime you're trying to choose which Medicare plan to select for the year. Having said that, President Trump's proposed budget calls for eliminating 94% of SHIP's funding, which could substantially scale down the program in 2018. Lower Costs - Even though you cover the Part B premium with both the options, additional monthly premiums with a Medicare Advantage plan are less (sometimes even $0) than premiums for a Medicare Supplement policy coupled with Original Medicare. Also, look at the Medicare Advantage plan's "Maximum Out-of-Pocket Expense," which establishes a limit on the highest possible amount of money you will have to pay out-of-pocket. These limits vary from plan to plan but typically range from around $3,000 to $6,700. Once you have paid that maximum amount, you will pay absolutely nothing for covered medical services for the balance of the year. Original Medicare does not come with an out-of-pocket maximum, so your costs are limitless and could typically be much greater). Similar to group health insurance - If you are leaving employment where health insurance was provided, a Medicare Advantage plan will seem very similar to what you are used to. Deductibles, co-insurance, drug coverage, physician networks, etc are all part of the health insurance package. Just one system instead of several - A Medicare Advantage plan can seem more logical. There is typically only one card to keep track of – not three. A lot of individuals choose to deal with one complete system instead of the separation of Original Medicare, Part D, and Medicare Supplement insurance. More coordinated care - HMO Medicare Advantage plans will require you to pick a Primary Care Physician (PCP). The PCP is the gatekeeper for your health care and is accountable for making certain that everybody on your health care team is communicating to everyone else concerning the best way to treat you. For individuals with complex, health problems that require a specialist to be involved, this can be invaluable. Benefits that Medicare will not cover - Medicare Advantage plans typically come with prescription drug coverage, plus vision, hearing and dental benefits. None of which are included in Original Medicare coverage. Once in a while, you will need to pay an additional premium for these benefits, but that is not the case for all plans that are being offered. If you prefer the service provider flexibility of Original Medicare, a Private Fee-for-Service (PFFS) plan is another alternative. This variety of Medicare Advantage plan doesn't come with provider networks, which can be handy if you need to travel frequently and don't want to be confined to providers in a particular service area. Alternatively, you can utilize any service provider that will allow the PFFS plan's terms and conditions and choose to treat you on a case-by-case basis. Always keep in mind that you are going to need to make certain your health professionals and hospitals contract with your plan every single time you require health-care. For insured individuals with unusual situations, a Special Needs Plan (SNP) is an additional option. This kind of Medicare Advantage plan limits enrollment to individuals in three groups: Those who have specific chronic illnesses; have Medicare and Medicaid; or live in a facility (for example, a nursing home). If you're qualified for a Special Needs Plan and you can find one available for your specific group in your service area, you might be able to sign up for the plan. One advantage of these plans is they build their benefits to satisfy the unique health needs of their subscribers. For instance, a Chronic-Condition Special Needs Plan for insured individuals with diabetes might have service provider networks with physicians who specialize in dealing with diabetes, or it could include wellness programs to help subscribers stay healthy and manage their illness. Medicare Savings Account (MSA) plans may be a very good match for individuals who don't worry about having higher out-of-pocket expenses before the plan begins to pay for covered medical expenses. These types of plans are a mix of a high-deductible insurance plan and a medical savings account. Your Medicare Savings Account plan deposits a certain sum of money into a savings account each year so that you can utilize it to pay for covered expenses before you've attained your yearly deductible. One of the benefits of Medicare Part C is that you can obtain prescription drug coverage bundled as a component of the Medicare Advantage plan. Wisconsin Medicare Advantage plans may incorporate prescription drug coverage with health benefits, also regarded as Medicare Advantage Prescription Drug plans. If you prefer the simplicity of managing all of your Medicare benefits beneath a single plan, this may possibly be a great option. In comparison, you'd ordinarily have to enroll in stand-alone prescription drug insurance coverage if you have Original Medicare. Keep in mind that if you choose to enroll in Medicare Part C and also want prescription drug benefits included, you should buy it through a Medicare Advantage Prescription Drug plan, not a stand-alone Medicare Prescription Drug Plan. As you can easily determine, you might have various options when it comes to Medicare Part C. Additionally, Medicare costs like monthly premiums, copayments, coinsurance, and deductibles may fluctuate when it comes to Medicare Advantage plans. Some Medicare Advantage plans may have monthly premiums as low as $0, but remember that you must still need to pay your Medicare Part B monthly premium, along with any cost sharing called for by the plan. Also, you should keep in mind that Medicare Advantage plans with low monthly premiums could charge higher amounts for deductibles and copayments, so start thinking about all of your out-of-pocket costs before enrolling in a plan. Probably the best benefit of Medicare Advantage plans is that they come with a yearly out-of-pocket spending limit. This would mean that once your health-care expenses (including the deductible) have attained the plan's maximum limit, the Medicare Advantage plan covers 100% of your covered medical expenses for the balance of that the year. Original Medicare doesn't include this benefit meaning there's no limit on how much you could possibly spend for health care in a given year. Who is Eligible for Medicare Plans in Wisconsin? Medicare Advantage plan eligibility is dependent on your eligibility for Original Medicare, Part A and Part B (except if you have ESRD). Typically, if you have Medicare Part A and Part B, you are eligible for Medicare Part C. Nevertheless, you have to live in the service area for the Medicare Advantage plan that you're interested in. If you have some other health insurance policy, for example with an employer or union, consults with your plan administrator about that plan’s guidelines before you attempt to enroll in a Medicare Advantage plan. In certain cases, you may forfeit your other protection if you enroll in the Medicare Advantage plan and you might be unable to get it back again if you change your mind later. To find out is a Wisconsin Medicare Advantage Plan is the right fit for you or to discuss the benefits and companies offering Medicare Advantage Plans in Wisconsin call 920-545-4884 for a FREE consultation.